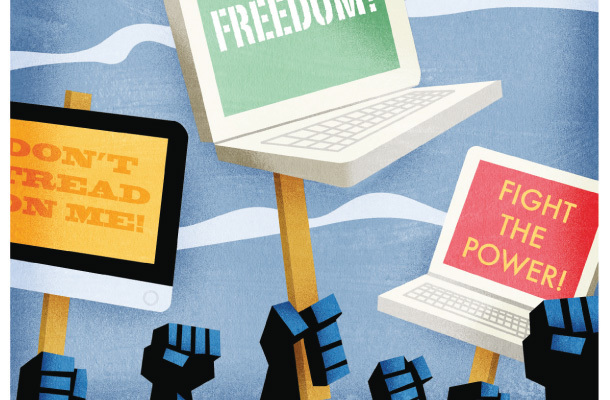 There’s the law of the land, but what about cyberspace? Online censorship expert Rebecca MacKinnon talks shop about her new book, “Consent of the Networked,” which hits shelves January 31. There’s the law of the land, but what about cyberspace? 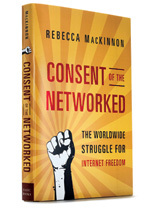 Online censorship expert Rebecca MacKinnon talks shop about her new book, Consent of the Networked, which hits shelves January 31. Q: Why Consent of the Networked? Q: Who are these sovereigns? Companies we rely on like Google, Facebook, Comcast, Verizon, AT&T, Apple–they shape your digital experience. And the government sets up your Internet service provider to track and make sure you’re not sharing files. They’ve created a surveillance system. As a chilling example, Amazon was hosting the WikiLeaks site and based on the political controversy, Amazon discontinued its relationship. But no one had proven that WikiLeaks had broken the law. Q: What would the Magna Carta 2.0 look like? Q: How do we accomplish that? the Internet remains compatible with whistle-blowing and the type of political organizing that both governments and corporations tend to find threatening. the government was eventually shamed into dropping the software program.